"I usually leave feeling better- my mood is usually upbeat. "You guys are amazing. You redefine what it means to take care of your mind/body. I've learned so much about my body since coming here. It works... Chiro works!!!" "Doc Tracy is a very knowledgeable, caring, funny professional who put me at ease enabling her to make adjustments necessary to relieve the pain that was preventing me from enjoying life. Thank you, Doc Tracy!" "Keep up the great work! Thank you for treating us like (better) than family." "I love Dr. Tracy! She really listens and is truly passionate about her job and patients. She cares and that means everything." "Truly feel better after every treatment, unfortunately I am old and broken. 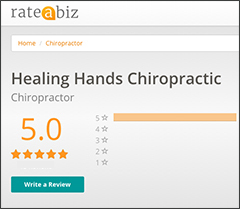 Had i started with chiropractor care earlier in life, I suspect i would be a lot better off. Suggest more Healing Hands for longer periods of time." "Don't change a thing! Best Team Ever!!!" "Chiropractic adjustments work!!! Tracy is amazing, makes you so much more aware of your body, the good and bad things we can do to improve." "Working with this team has allowed me to walk more than a block without being in extreme pain, looking forward to continuing to be able to do much more again in my life without pain." "Tracy does great work on body." Dr. Tracy is wonderful! She is an excellent doctor. She made me feel comfortable and she answered all of my questions. It's been a long time since i have been to a knowledgeable Doctor. I am out of pain and I feel great! The one thing that I feel that makes second to none is on the first visit, she called me later that day to check to see if I was ok, and how I was feeling. Very professional, I don't think any other doctor does that anymore." "Love Dr. Tracy, how knowledgeable she is and vast improvement I experienced after beginning care with her." "I have been able to enjoy this pregnancy because since i started coming to the chiropractor I haven't experienced a horrible pain in my lower back or my buttock. I am able to do my daily chores." "Keep up the amazing job - all three of you!!" "Dr. Tracy is amazing. I thought with arthritis, I would have to live with the pain, But I don't." "Keep up the good work. Your office is very caring and helpful. I feel very safe and comfortable here." "I feel very confident on Dr. Tracy's treatment of me and can say that almost from the beginning I started to feel positive changes." "I love this place. I drive from New Haven to come here. Highly recommend to others." "Tracy has helped me far longer than I thought could be possible. I cannot imagine life without her and her treatments. She has made a personal commitment to make me comfortable. You can't find that in many places or from many people. I feel blessed because of her treatment." "I love the treatment I'm getting. Everyone is warm, welcoming and knowledgeable and willing to help. Dr. Tracy is amazing & kind. I am so happy my friend referred me over to her. I have seen much improvement! Thanks to All." "Dr. Malton has continued to be harmonious in the road to recover my health. I believe she is a true healer in every sense of the word. Her constant care has been a gift. I just Love her <3." (Tracy) to have been taking care of me and allowing me the quality of life I possess. "Without the care I get I know I would have had at least one operation on the three missing discs in my neck. If that happens it could be worse and that is a gamble I'm not willing to take. I am so grateful for "healing hands" (Tracy) to have been taking care of me and allowing me the quality of life I possess. "Dr. Tracy and her staff are wonderful to work with. Dr. Tracy is caring and makes each visit a comfortable experience." "I have gotten much more than my back "cracked". :) Dr. Malton gave me hope in healing my spine through adjustments that I did not know was possible! She taught me about the importance of preventative care and the body's ability to heal itself :) and gave me a healthy dose of positivity each visit (which is just what I really needed in my life right now). My only regret is that I didn't start sooner! Dr. Tracy Malton, you are sent from up above <3 <3 <3." "Dr. Malton is different from other DC's I've seen. She is thorough gets to the root of the problem, and really listens. I feel so much better after seeing her.!" If a patient does not have insurance, Healing Hands Chiropractic, LLC can set up a payment plan or monthly plan.